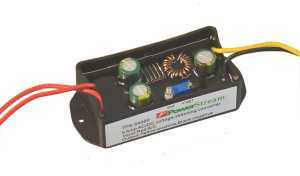 24VAC to variable DC converter, 20 Watts output adjustable from 1VDC-18VDC. Tiny switchmode 24VAC / 5A power supply offers much higher efficiency and lower ripple than the linear versions. The biggest application of these is to power 3.3V, 5V, 8.4V, 9V, 10V, 12V, 14V, 15V, 16V devices in 24VAC installations. DC input When using a direct current input, connect the plus and minus to the input terminals, it doesn't mattery which is the plus or minus, since we put a full bridge rectifier on the input, which will sort it correctly. * 50/60Hz ripple will go down as the current goes down, as it is due to the size of the input capacitors.